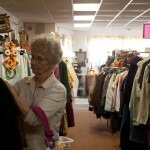 Anyone who has lived in St. Ignatius for any time has most likely donated to or bought from the Folk Shop, the town’s premier thrift store for more than 30 years. 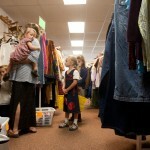 Executive Director Barbara Rentschler said the Folk Shop was founded with a goal in mind. 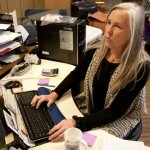 “(We) employ the handicapped in meaningful jobs while serving needs of the local community,” she said. In the late 1970s, some St. Ignatius parents were looking to establish a place of steady employment for their disabled children. 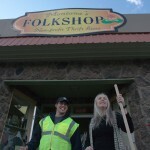 They joined other community members who wanted to help, and the Folk Shop was born. The store currently employs five disabled personnel, who are assigned jobs that range from organizing the store to crushing cans for recycling. Some of the store’s employees have been working at the Folk Shop for years. 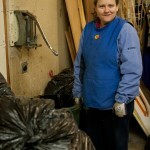 Heather Coleman, the Folk Shop’s resident can-crusher, has worked at the store since its opening. Community members donate most of the Folk Shop’s items, and everything is sold within the store, never over the Internet. Some items are donated and resold multiple times over the years, Rentschler said. 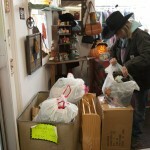 “It’s keeping all this stuff out of the landfill,” she added. 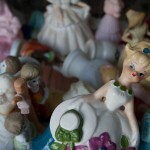 However, it’s not just the items in the Folk Shop that come full circle. Rentschler donates some of the store’s proceeds and recycling revenue to help community members in need. “We try not to ask for much from the community and just try to give back as much as we can,” Rentschler said. 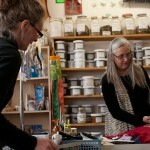 As a nonprofit organization, the Folk Shop does not accept any public or government funding. It survives entirely on the community’s support.